News 11 Aug 2006: Patriot Antennas, the N. America antenna manufacturer based in Albion, Michigan, announced today a transportable flyaway version of their unusual offset segmented antenna. Its dual skin technology means that high profile accuracy is maintained and operation from C band through Ku, X and Ka band frequencies is possible. The larger size make it suitable for regular C band VSAT applications as well as for applications where there is a significant transmit eirp requirement, as transmitter (BUC or HPA) powers may be kept moderate by using the extra transmit gain of the larger dish. 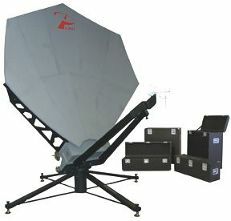 It is ideal for satellite TV broadcast, military or similar satellite application. The antenna is lightweight and rugged and may be set up in 20 minutes or so. The antenna comes in seven packing cases for safe and efficient transport. Total weight is 741.5 lbs. Options include feed assemblies for C, Ku, X and Ka band frequencies as well as motorised arrangements. 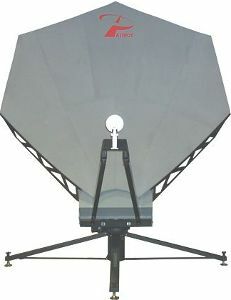 For the manufacturer's technical antenna specifications see: http://www.sepatriot.com/PDF/2_4m_Flyaway.pdf (145k pdf file). This old document includes transmit and receive gain figures, cross-polarisation isolation figures, both on-axis and on the -1 dB contour plus packing crate dimensions etc. The images above are published with the kind permission of Patriot Antenna Systems, 704 North Clark Street, Albion, MI, 49224, USA and the text is derived from their email press release dated 11 Aug 2006. Note the update information above regarding closure of the company and its new ownership. The link to the pdf spec still exists at sepatriot.com and is retained for the interest of anyone who has one of these antennas or is considering buying second-hand.